The eyes can be affected by a number of congenital malformations which can present as an isolated anomaly or in a syndromic association. In this article, we will cover some common congenital malformations of the eye and the ocular adnexa. Cataract refers to increased lens opacity. Acorea, microphthalmia, and cataract syndrome is a rare genetic disorder that is characterized by fibrous occlusion of the pupil, small eyes, and cataracts. The condition affects both eyes. Microcornea, iris and corneal dysgenesis are other common features of the syndrome. The fundus examination reveals a normal retina and optic disc. The mode of inheritance appears to be autosomal dominant. Aniridia is a congenital anomaly that is characterized by the absence of the iris. The condition is usually bilateral. Unilateral aniridia is associated with macular dysgenesis and optic nerve hypoplasia. Cataracts and corneal dysgenesis are also seen in patients with unilateral aniridia. Because of the macular and nerve abnormalities, patients might develop nystagmus and amblyopia. Patients with aniridia might have the ocular anomaly as part of a syndromic disorder known as WAGR syndrome. In WAGR syndrome, patients have Wilms tumor, genitourinary anomalies, intellectual disability, cerebellar ataxia and aniridia. The condition arises from a mutation in the PAX 2 gene that regulates development of structures of the eye. The gene is located in AN2 region of chromosome 11. This is a congenital malformation that is characterized by the complete absence of one or both eyes.This refers to the globe and other ocular tissues. Patients with anophthalmia also do not have ocular adnexa or ocular muscles in the affected eye orbit.They also have a small orbit, small eyelids and malar prominence. Prenatal ultrasound is the diagnostic modality of choice to screen for and confirm the diagnosis of anophthalmia. Newborns with anophthalmia should undergo a magnetic resonance imaging study to study and visualize the orbit. Cosmetic surgery and the implantation of a prosthetic eye are the only available options for infants with anophthalmia. This congenital anomaly is characterized by the presence of a narrow horizontal palpebral fissure. It may occur as an isolated anomaly or as part of blepharophimosis syndrome that comprises of blepharophimosis, ptosis, and epicanthus inversus syndrome. Epicanthus inversus syndrome is characterized by the presence of a skin fold that goes in a mediolateral direction inferior to the inner canthus. Patients with this syndrome also have a low nasal bridge, and telecanthus. It is inherited in an autosomal dominant pattern and arises from mutation of the FOXL2 gene. Patients with nystagmus might have zonular cataracts, which is a rare congenital anomaly of the eye. The most likely inheritance mechanism is x-linked. Therefore, zonular cataracts is an ocular cause of congenital nystagmus. A coloboma is a congenital hole in one of the structures of the eye. The hole might be found in the iris, retina, choroid, or optic disc. Coloboma is a condition that is always present at birth. Most cases of coloboma affect the iris. The estimated incidence of coloboma is one per 10,000 live births. PAX2 gene mutations might be associated with coloboma. Moreover, up to 90% of children with fetal alcohol syndrome have an eye congenital anomaly, with colobomas being the most common. Chromosome 22 abnormalities are also associated with colobomas. Treacher Collins syndrome is an autosomal dominant disorder that is characterized by the presence of colobomas. Treacher Collins syndrome is caused by TCOF1 gene mutation. Colobomas can be treated with a specialized cosmetic contact lens. Surgical repair of large iris defects is another option. Patients with ectropion present with a lower eyelid that turns outwards. Newborns with Harlekquin-type ichthyosis present with ectropion. Mild- only a part of the eyelid is outturned. Severe ectropion- the entire length of the eyelid is outturned. These risk factors all share a common pathophysiologic consequence, i.e. lower eyelid muscles’ weakness. Ectropion can be also congenital. Irritation and gritty sensation of the eyes. Sensitivity to light due to lack of moisturization of the eyes. Ectropion is a condition that is treated with surgical repair techniques. Entropion is another medical condition that is related to the lower eyelids. In entropion, the lower eyelids fold inwards. In contrast to ectropion which is usually painless, entropion is associated with significant discomfort because of the rubbing of the eyelashes with the cornea. Patients with entropion typically present with redness and pain around the eye, light sensitivity, epiphora, and a decreased visual acuity if the cornea is damaged. Entropion is typically treated with a simple surgical procedure. The prognosis after surgical repair is excellent as long as the cornea is not damaged. Keratoglobus is a degenerative non-inflammatory disorder of the eye that is characterized by corneal thinning and the transformation of the shape of the cornea from a normal gradual curve to a globular shape. The progression of keratoglobus is unpredictable, mainly because of our limited understanding of the pathophysiology of the condition. Keratoglobus is associated with impaired vision, but not blindness. Patients with keratoglobus are at risk of eye-globe perforation. Keratoglobus is a condition of adolescents. Keratoglobus is a surgical condition. Corneal transplantation is needed for the optimum treatment of keratoglobus. When the nasolacrimal duct gets obstructed, the patient presents with an excess overflow of tears. The excess overflow of tears is known as epiphora. The acquired form is more common among females aged between 50-70 years. There has been no racial predisposition noted. 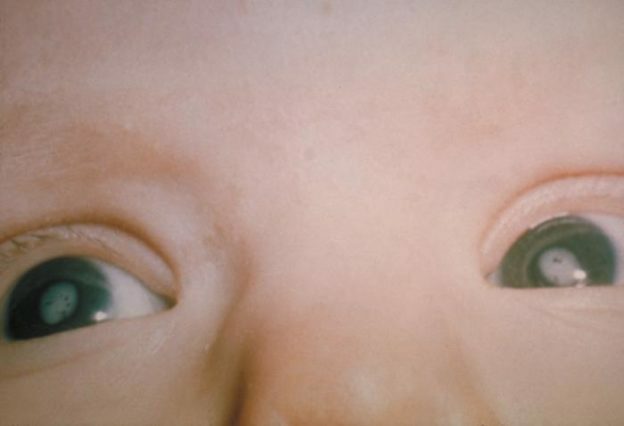 Congenital nasolacrimal duct obstruction is called dacryostenosis. In the congenital form of the disease, the lacrimal ducts fail to open at the time of birth. Up to 6% of infants have congenital nasolacrimal duct obstruction. Patients with nasolacrimal duct obstruction are at risk of developing a secondary bacterial infection of the lacrimal ducts known as dacryocystitis. Dacryocystitis resolves spontaneously and antibiotics are not indicated, unless the patient develops bacterial conjunctivitis. The dye disappearance test can be used to confirm the diagnosis of nasolacrimal duct obstruction. The irrigation test is also useful in confirming the diagnosis. The obstructed ducts can be intubated and stented to drain the entire lacrimal ductal system and reopen the ducts. Dacrocystorhinostomy (DCR) is indicated in patients with congenital complete nasolacrimal duct obstruction. Antibiotics for infective causes of duct obstruction. Ptosis is defined as the drooping of the upper eyelid. Ptosis is usually worse by the end of the day. Ptosis can be caused by oculomotor nerve palsy, facial nerve palsy, or Horner’s syndrome. Brain tumors, diabetes mellitus, and Pancoast tumors can also cause ptosis. Trauma and inflammatory conditions of the upper eyelid can also cause ptosis. Myasthenia gravis can present with ptosis by the end of the day. Morphine, oxycodone, heroin, and hydrocodone can cause ptosis. Pregabalin is also associated with mild ptosis. Neurogenic ptosis due to oculomotor nerve palsy, Horner’s syndrome. Myogenic ptosis due to myotonic dystrophy, ocular myopathy, or myasthenia gravis. Mechanical ptosis due to edema or tumors of the upper eyelid. Neurotoxic ptosis due to drugs and toxins. Bites by venomous snakes such as taipans, mambas, and cobras can cause neurotoxic ptosis. Aponeurotic and congenital ptosis are usually treated surgically with levator muscle resection, muller muscle resection, or a frontalis sling operation. Treatment of oculopharyngeal muscular dystrophy or myasthenia gravis results in improvement of the ptosis.